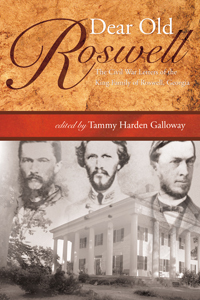 The King family, spread between Roswell, Georgia, and Virginia, faced the perils of the Civil War on different fronts. These correspondences will captivate the reader as they cover Barrington S. King, a Lieutenant Colonel in Cobb’s Legion, leaves his home in Georgia to fight in Virginia. On the other end of the correspondence are his father, mother, and young son in Roswell. Between Barrington and the family is his devoted wife, Bessie, who followed her husband to Virginia and traveled between the front and Roswell periodically, providing a woman’s view. Since many letters belonging to Bessie as well as Barrington survived, different impressions of the same incidents are given. In addition, the letters also cover the King family’s company, the Roswell Manufacturing Company, which manufactured cloth for the Confederacy; the death of friends and a brother in the war; the refugee experience of those fleeing Northern advances on Atlanta; accounts of the Union forces occupation of Roswell, including the opening of Roswell King’s buiral vault, a secret Bessie kept from her husband’s relatives; and details of Jessie, the trusted family slave, who followed King to Virginia and escorted his wife and youngest son throughout the war.